Kauai has a reputation as a romantic and quiet island and after a recent trip with my husband and children we found how family friendly it is as well. Our hotel of choice for this family vacation was the Kauai Marriott Resort and Beach Club in Lihue. The beautiful entrance is situated among swaying palm trees and adorned with numerous tiki torches. Entering the spectacular open air lobby you'll find Koi ponds, beautiful swans and lush tropical gardens. Kauai has a reputation as a romantic and quiet island and after a recent trip with my husband and children we found how family friendly it is as well. 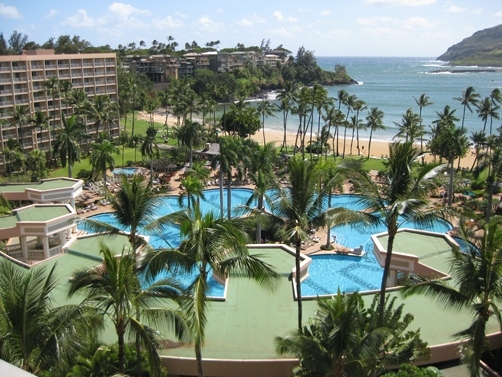 Our hotel of choice for this family vacation was the Kauai Marriott Resort and Beach Club in Lihue. The beautiful entrance is situated among swaying palm trees and adorned with numerous tiki torches. Entering the spectacular open air lobby you’ll find Koi ponds, beautiful swans and lush tropical gardens. Our room overlooked the pool, the white sandy beach of Kalapaki and an encompassing view of the ocean. The nice sized balcony provided great views and a place for the adults to have their own space after bedtime for the kids. A wonderful start to the day is a poolside breakfast at Kukui’s restaurant. Menu items range from omelets to fresh local fruits and for a heartier meal choose from the delicious breakfast buffet. All to be enjoyed in the casual outdoor setting. The pool looked so inviting that we went to explore right after we left Kukui’s. 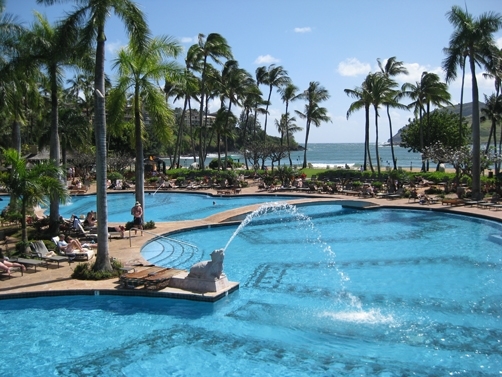 The family friendly pool is one of the largest pools in Hawaii and is surrounded by five private whirlpools. Sip a coffee or drink by the pool while you watch the children splash and swim and experience paradise family style. Steps away is an amazing cove for swimming, boogie boarding or just enjoying the sandy beach. If you are still playing in the water and don’t want to venture to far from the pool or ocean, order lunch and drinks from the Kalapaki Grill. The menu is simple but good offering burgers, salads, fresh fruit and of course the Kalua pork sandwich. The Keiki Corner menu will make the kids happy and as a special tropical treat, order them a virgin lava flow drink (pina colada with strawberry in the middle). After a morning of fun in the sun head off to Smiths Fern Grotto for a great family adventure on the Wailua River Cruise. 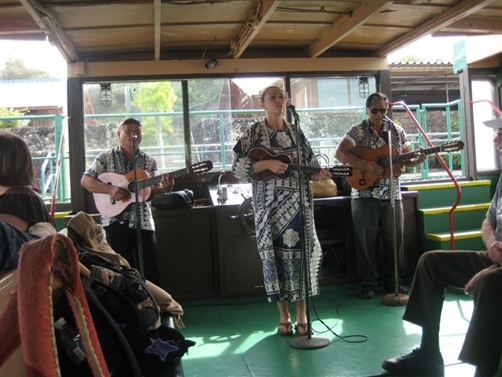 The open air boat winds up the Wailua River with live entertainment including songs and the telling of legends of this valley that may have you feeling like you have gone back in time. After the two mile journey, the boat arrives at The Fern Grotto for a walk through the lush rainforest and a wonderful live rendition of The Hawaiian Wedding Song. On the return trip the hula dancers give everyone a few tips on how to “hula”. The entire trip is approximately one hour and twenty minutes. Upon returning from the River cruise take a few minutes walk on the same property to The Smith Family Garden Luau. It is one of the most exciting Luau’s on the island of Kauai. The Smith family has been sharing the traditions for over 50 years and currently four generations are involved with the luaus at Smith’s Tropical Paradise. Explore the 30 acres of gardens either with a leisurely stroll or a guided tram tour. 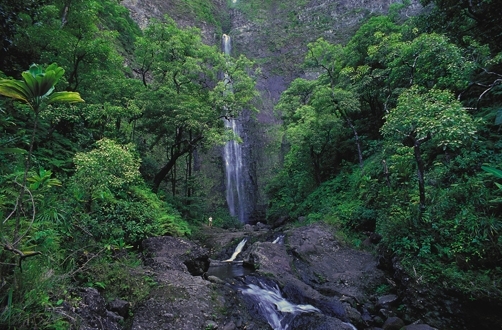 There are tropical gardens with many varieties of fruit and island trees, fresh-water ponds and exotic flowers. Next, the Imu Ceremony; a Hawaiian cooking method called Kalua where the pig is wrapped in ti leaves and cooked in an earthen imu oven. Afterwards adults are invited for a Mai Tai, punch for the children and all enjoy festive music prior to the Luau feast. The dinner includes some traditional flavors and as well as island favorites: kalua pork, beef teriyaki, chicken adobo and sweet n’ sour mahi mahi, Hawaiian sweet potato, lomi salmon, poi and tropical deserts. The Hawaiian music and songs continue on through dinner until it is time for the hula lesson. You can’t have a luau without learning the hula. The brave participants up on stage becoming masters of this traditional Hawaiian dance. Again, on the same property and just a short walk is the next extravaganza called The Rhythm of Aloha Show. In an open air, torch lit amphitheater the show has amazing and authentic performances from Hawaii, Tahiti, Samoa, Philippines, New Zealand, China and Japan. All are cultures of the Hawaiian heritage. It is exciting to watch the fast paced action in the amazing tropical Kauai night. From the Tahitian Drum dance to the Samoan fire knife dance to the few sprinkles of rain and the tropical balmy breezes, The Rhythm of Aloha was a perfect ending to a perfect day. 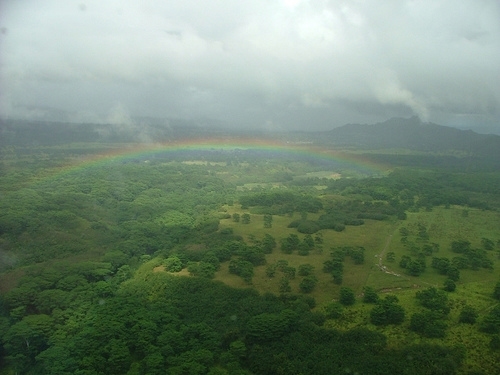 Click here for more Kauai Articles.